Doctor Khurana is a wonderful cardiologist. He spent several minutes walking me through test results, what he can see, andthe situation at hand. Additionally, he was able to use diagrams to better show me what could be occurring. I never feel rushed when discussing questions, concerns, or details and highly recommend him. Doctor Khurana is a wonderful cardiologist. He spent several minutes walking me through test results, what he can see, and the situation at hand. Additionally, he was able to use diagramsto better show me what could be occurring. I never feel rushed when discussing questions, concerns, or details and highly recommend him. Glad I was able to greet second opinion and have an actual plan provided by the doctor. He is patient andvery knowledgeable. 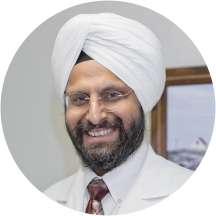 Dr Charanjit Singh Khurana has distinguished himself and earned the respect of his peers and colleagues. Having worked in three different continents, he has a diverse and extensive medical experience. He went to medical school in Bombay at the Grant Medical College, followed by postgraduate training at the J.J. Group of hospitals in Bombay. He acquired further training in cardiology in England and he was elected a member of the Royal College of Physicians. In the United States, while completing his residency at the Cleveland Clinic, he received the Internal Medicine Residents Research Award. During his Cardiology fellowship at George Washington University, he won the prestigious Cardiology Fellows Forum of Excellence Award. He is Board Certified in Cardiology, Interventional Cardiology, Nuclear Cardiology and Diagnostic Vascular Sonography. My appointment with Dr. Khurana was excellent! It was really refreshing to have a doctor take his time in the appointment to make sure I understood what he was saying. He broke down medical terms and showed examples of what hewas talking about. Additionally, I spent more time with him than the nurse which is something really rare. Overall, I'm really happy with my choice to see Dr. Khurana and would recommend him to anyone looking for a cardiolologist. Great doctor, very thorough & very nice.